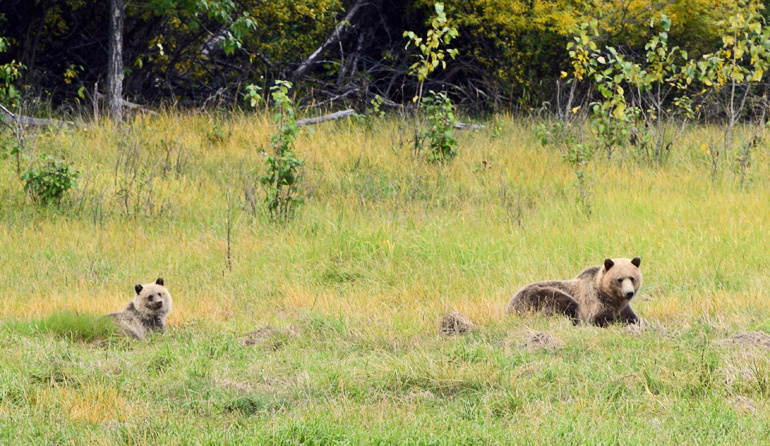 Grizzly bears depend on huckleberries as a critical food source to fatten up before winter hibernation. A new approach maps where they grow. When berries reach peak ripeness in mid-July, they make up about half of the diet for the hundreds of grizzly bears that live in and around Montana’s Glacier National Park. Despite the importance of huckleberries to grizzly bears, listed as threatened in the lower 48 states, scientists don’t have a comprehensive way to know where the shrubs are located across the park’s vast terrain. Tracking where huckleberry plants live now—and where they may move under climate change—would also help biologists predict where to find grizzly bears. Scientists describe the approach, which uses publicly available satellite imagery, in the International Journal of Remote Sensing. “The inspiration behind the research was to map huckleberry patches to identify and protect areas of prime grizzly bear habitat,” says lead author Carolyn Shores, a doctoral student in the University of Washington School of Environmental and Forest Sciences, who also works as a caribou biologist for British Columbia’s fish and wildlife agency. Huckleberry plants are an important cultural and economic resource for people, as well, particularly indigenous communities in the US and Canada. Given the significance this plant plays in the life history of people, bears, and dozens of other species, biologists need to map and assess changes to their distribution to learn how to conserve them, says senior author Tabitha Graves, a research ecologist with US Geological Survey who is based in the national park. “This tool will be combined with future models of the timing and productivity of berries to inform managers of options for protecting food for bears, birds, pollinators, small mammals, and humans,” Graves says. While the researchers used Glacier National Park as a test site for mapping huckleberries, other scientists could use the approach around the world to map other important shrub and tree communities, or track the progression of disease or insect outbreaks, the authors say. The research team used satellite and aerial imagery from two different sources—NASA’s Landsat images and the US Department of Agriculture’s National Agriculture Imagery Program—to examine patterns in huckleberry plants that turn a brilliant red color each fall. Those plants’ bright, distinguishable color makes it possible to pick it out seasonally among other plants in the landscape. Landsat satellites have taken regular photos of the Earth’s surface down to 30 meters (100 feet) resolution for more than four decades. These aerial images helped the research team pick out the unique visual patterns of huckleberries in areas where the plants live, then use modeling to predict their distribution across the entire park. The National Agriculture Imagery Program images were taken less frequently, but at a higher resolution of 1 meter (3 feet). Researchers used these images to train a computer to recognize huckleberries, then map the entire park with the information. Both methods rely on the bright red color in autumn that distinguishes huckleberries from most other plants. To test the accuracy of each approach, the team hiked to areas in Glacier National Park where huckleberries live, making sure that the plants in fact lived where the aerial photos showed they were. In total, their mapping techniques were about 80 percent accurate. The methods worked less well for mapping huckleberry plants under tree cover, but the plants often grow in open areas. The technique will also help answer questions about the impacts of wildfire or other disturbances on huckleberry distribution, the researchers say. “Our approach is the first we know of that attempts to distinguish an individual understory species based on color change,” Shores says. Other studies have used satellite imagery to identify taller species, such as trees killed by beetles in Canada, she says. 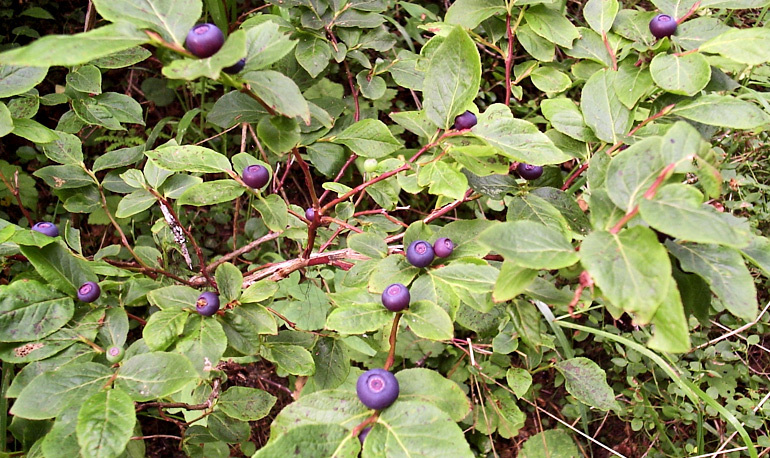 During the mapping project, researchers found that most huckleberry plants in Glacier National Park are more than 100 meters (328 feet) away from hiking trails, which bodes well for grizzly bears to feed with little disturbance from humans, Shores says. While this study focused on mapping the distribution of huckleberry shrubs in the national park, the next step is to complete several other studies aiming to understand the huckleberry life cycle and predict the timing of berries, researchers say. That information will help grizzly bear managers consider where human-bear conflicts might occur and work to minimize them. “My vision is to have a real-time prediction of potential human-bear conflict areas,” Graves says. Will climate change create more ‘pizzlies’?